One hour to Myself Outside the House! 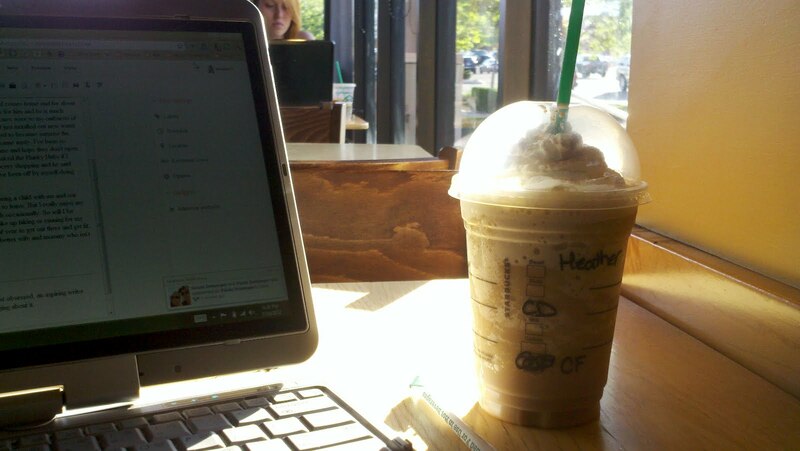 I am sitting here in a Starbucks with a laptop and a frappuccino all by myself. No children. Just me. Sitting here…alone. And it’s so nice. My thoughts are not interrupted by screaming children, or someone begging me to read to them, or nurse them or build towers and castles for them. It’s just me. As I look around there are three other people in here with laptops. College students of course. It is a college town. Then there’s me, the desperate stay at home mom in need of me time. What started this? Last Friday I was talking to my husband on IM from work and we got into a stupid little spat. It was really stupid and I was being really ugly and nasty about little things. By the time he had gotten home I had regretted half the things I said and couldn’t figure out why I had said them. He came home and started painting the hallway trying to put behind him the nasty things I said, but I knew it had bothered him and I just wanted to cry. Why did I make the person I love the most in this world feel so horrible? I went back and read our chat history and was just disgusted with myself, but my anger, although none of it really his fault, came from somewhere. It came from me wanting some time to myself. See my husband comes home and for about a year and a half now has an hour to himself to game. I think its great and healthy for him and he is much happier when he gets this time. But after thinking about what all the underlying issues were to my outbursts of anger, I realized I just need some time to myself. It was Friday, the plumber had just installed our new water heater, I hadn’t showered since Tuesday and then couldnt’ shower when I wanted to because surprise the plumber is here and it will be a four-hour job and I just couldn’t take it and I became nasty. I’ve been so desperate for a shower sometimes that I just put the kids in the bathroom with me and hope they don’t open drawers and get into things. So finally after figuring out what I really needed I asked the Hunky Hubs if I could start having an hour outside of the house twice a week and not to go grocery shopping and he said yes. So he is at home with the kids and this is the first time in maybe 5 years I’ve been off by myself doing something I enjoy. The last time I even hit the road by myself I had to come back due to a funeral and now with children I probably won’t be hitting the road again for some girlfriend time until the kids are in school. Now occasionally I get together with my pal Tiffany for coffee, but I usually bring a child with me and our visits are always a distraction because someone is throwing a fit and we have to leave. But I really enjoy my get-togethers with Tiffany and I’m blessed I have a friend I can get coffee with occasionally. So will I be sitting here at Starbucks twice a week blogging? Probably not, but I might take up hiking or running for my hour of me time. We live in a great neighborhood and it’s definitely the time of year to get out there and get fit. So I am taking back some me time and it feels good and I know I will be a better wife and mommy who isn’t so stressed out in the long run. What do you do with your mommy free time, do you have mommy free time? Its amazing the difference one hour can make! I have to say, sitting in a coffee shop for an hour by myself sounds absolutely devine — I hope my husband thinks so too. I can so relate to this. I have a terrific husband and I start an argument when I really don’t need to. During the summer, I don’t have much “me” time because my kids are out of school. But every now and then whenever they go off to friends houses, I do get a few hours of peace and quiet. I enjoy it but after an hour or so, I start missing my kids and the noise lol. I totally get that too. I know that when I do return to an outside the house work force one day, my me time will be just as important. I think what this post needs to drive home is that it is healthy to unwind from the day to day grit whether you are a work out side the house mom or a work at home mom. That unwind time helps you to refocus and regather yourself for the next day. Oh that me time is so important. I’m a work outside the home mom but I think, in the end it’s all the same. Yes I get time away from the demands of being a mother for part of my day, but it’s still not me time, it’s someone else’s time. There are few opportunities these days to just be myself and do what I want to do. Last month I look a day off and drove the little one to daycare as usual in the morning. It was strange yet wonderful to drive back home to an empty house. I spent the day cleaning and packing for the trip I was taking her on the next day, but it was at my pace with no other demands to worry about. I think I will do it again soon! My husband and I try to accommodate each other whenever the other needs me time. He likes to game and I like to read… Or nap lol. I think it’s really important and makes us better parents and happier people!